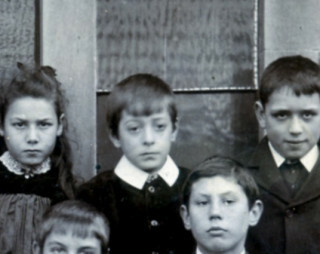 Amos Tinkler (central figure) aged 8, seen in a Muston school photograph taken in 1902. Report of the wedding of Lois Tinkler to T.Pacey, published Saturday, 18th April 1914. Amos Tinkler is one of the men recorded on the Muston list of Absentee Voters, 1918, which reported his address as May’s Row, Muston. The 1901 census of Muston records that George Tinkler, a 48 years old ironstone labourer born in Muston, and his wife Ann, 43 years old from Corby, Northamptonshire, lived at Chapel Lane, Muston, with their four children: James aged 14, a brick land labourer, Agnes aged 13, a domestic maid, Lois aged 10, and Amos aged 7. He was not recorded in Muston in the 1911 census, but it is not known where he was at this time. The General Register of Births, Marriages and Deaths confirms that Amos Tinkler was born in 1893, and adds that he married Ethel A. (Adelaide) Whitworth in 1916. He died in June, 1970, in the Nottingham area, aged 76. Amos is seen in the Muston School photograph of 1902 (courtesy of Mr Alan Hodgkinson), a rather solemn and delicate looking eight-year old. Interestingly, in one of the entries in his service papers he gave his home address in 1918 as in Buckinghamshire, suggesting that he and his wife had started to set up home there. At the time the Absentee Voters list was assembled in 1918, he was perhaps not a resident of Muston strictly speaking, and yet his parents had him included as a Muston absentee voter. In any case, the couple returned to Muston after he had been demobilized and lived in May’s Row, a terrace of cottages that stood at the junction of Main Street and Church Street in Muston (subsequently demolished). In the Spring, 1921 Electoral Roll, Amos Tinkler lives at May’s Row, with his mother Ann and brother James William (though his wife Ethel was not included on this electoral roll). In 1925, both Amos and Ethel Adelaide Tinkler live at May’s Row, still with Ann and James. However, in 1929, Amos and Ethel Tinkler were at 19 Orlando Drive, Carlton, Nottingham, and by 1931 they had moved to 45 Valley Road, Carlton. The Grantham Journal of Saturday, April 18th , 1914, reported the wedding at Muston of Amos’ sister Lois Tinckler to Mr T. Pacey of Stenwith – Amos was the best man. This article gave his parents’ address as Hospital Cottage, Muston (presumably a cottage adjoining Hospital Farm). Amos enlisted twelve days later. Several pages of Amos Tinkler’s service records are held by the National Archive and can be examined online, though his Attestation paper and medals card are not among them. Amos Tinkler enlisted on 1st May, 1914, as Private 240310, 5th Battalion, Leicestershire Regiment, aged 20, Church of England, his civilian occupation described as a “horse trainer and farmer”. He was to remain in the army until demobilized in March, 1919. He first saw active service in France, from February 1915 to December 1916. In the latter part of 1916, he was admitted to hospital three times, including time in field hospitals at St Pol and at Le Treport, suffering from diphtheria. On the 18th December 1916 he was awarded a GC Badge, and then on the 25th of that month he was transferred back to England for a period of home leave during which he got married at Muston. His bride was Ethel Adelaide Whitworth from Laxton, Nottinghamshire. He subsequently gave her address as: Ridingpost Farm, Clarborough, near Retford, Nottinghamshire. The Grantham Journal of Saturday, Jan 15th , 1916, reported the wedding of Ethel Adelaide Whitworth of Laxton, Nottinghamshire, to Amos Tinkler. The ceremony was witnessed by Private Ernest Wakefield and his wife. The report also states that, sadly, Ethel’s brother had been killed on the 5th September, 1915. 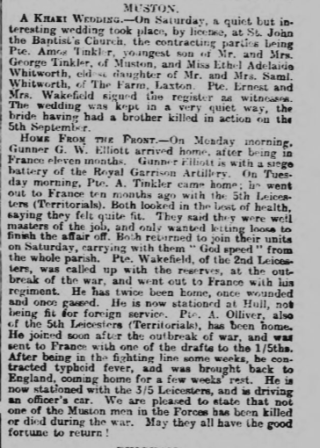 The Grantham Journal article continued with an account of the Muston lads home on leave, “Home From the Front”, including Gunner George W Elliott (Royal Garrison Artillery), Private Amos Tinkler (5th Leicesters, Territorials), Private Ernest Wakefield (2nd Leicesters) and Private A Olliver (5th Leicesters, Territorials). It concluded by saying, “We are pleased to state that not one of the Muston men in the Forces has been killed or died during the war. May they all have the good fortune to return.” In fact, Elliott, Tinkler and Olliver did survive the war, but Ernest Wakefield sadly was killed in action in Mesopotamia on March 8th 1916. Amos Tinkler later recorded that he served in Italy from February, 1917, to May, 1918, and then Greece from May, 1918, to March, 1919. On 10th January, 1918, he was promoted to Corporal. On 11th January,1918, he was transferred to the Royal Engineers, becoming Sapper 289770. He was posted to the 2nd “North” (later stated as the South) Midland Field Survey Company, “a proficient sapper”. Unfortunately, the last part of this time in the army was marked by repeated bouts of sickness. He was admitted to hospital on 31st December, 1918, with influenza, and again on 4th January, 1919, 23rd February, 1919 and 6th March, 1919, before being invalided back to the UK on 7th March, 1919. His medical reports described him as having extensive pains, being very debilitated, and showing evidence of malaria. He was finally “Disembodied on Demobilization” on 24th April, 1919, at Chatham. At this time, his home address was: Wood Farm, Emberton, Newport Pagnall, Buckinghamshire. Unfortunately, we have not yet found information about the medals he was awarded.